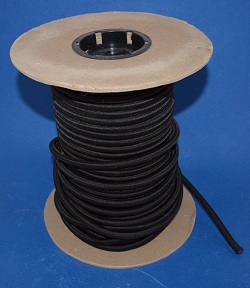 Very high quality bungee (shock cord). 3/8". Stranded inner with woven jacket. (Jacket may be nylon, polypropylene and polyethylene.) Price shown is per un-stretched food. Order by the foot. This is 100% stretch cord. ie, a 6' long piece will stretch to 12' long. To get the correct length cord measure the total length of the thing you are trying to bundle and multiple by .80 for a gentle hold, .70 for an average hold or .60 for a very tight hold. Set your cut length to whatever you like, quantity to the number of pieces you want and then click on the "add to cart" button. To add more pieces to the cart of different lengths, just hit the back button and repeat as many times as needed. Ends will be fused for you.